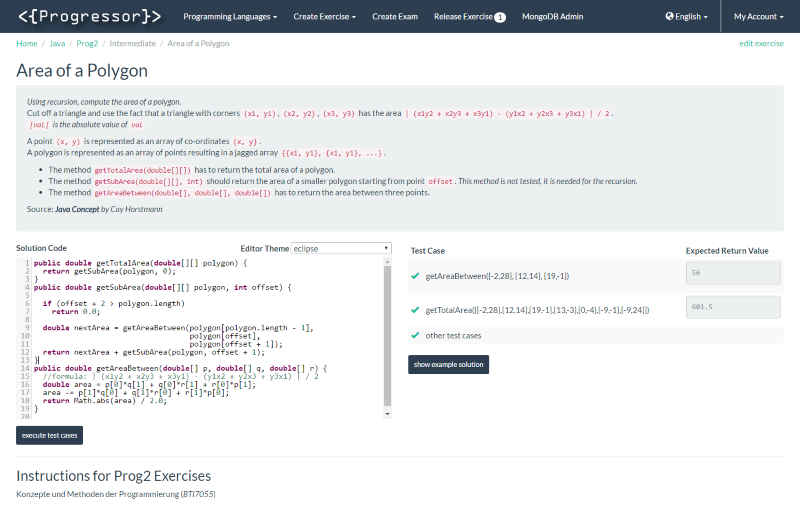 Progressor is an open-source project for programming teachers. It allows to create programming exercises which students can solve online, letting them check their solution directly from their browser in a wide variety of languages. When learning to program for the first time, practice is of first importance. Learning the basics of a programming language and its paradigm requires some theory and a lot of practice. All around the world, many students start their studies before acquiring fluency in English, the de facto language of Computer Science and programming. This should not be an obstacle to learning basic programming skills in the early days of their studies. The most important thing for students is to be able to train without the sometimes huge overhead of installing a bunch of tools, opening many exercise files, writing their solutions, executing test cases, going back to the code, etc. Progressor abstracts all these painful details, allowing students to work directly from their web browser, focusing on what matters first: becoming familiar with loops, working with lists, understanding functions, etc.